You and I love Chucks and we know that. But here's a little more reason to love them further as Converse Philippines release Chuck Taylor All Star II Gum. If you're thinking about that bubble gum you had when you were a kid (or maybe until now) that's exactly the material they use as rubber soles instead of the regular one we get from the tree. The material has the same grip and durability as with classic Chucks plus the super comfy Lunarlon insole which I so love! Now there's no more pain walking around because of that, plus you're getting premium canvass with a gum rubber side wall and toe cap which I'm sure design wise, you'll love. For added comfort, they also added padded non slip tounge on top so you always get the comfort you deserve. Now you've got a choice, whether high cut or low cut, take a different look in these Converse Taylor All Star II GUM shoes in 3 colors. Black, Herbal or Obsidian, you'll get to mix and match with your current wardrobe and still look cool any day, or any night. 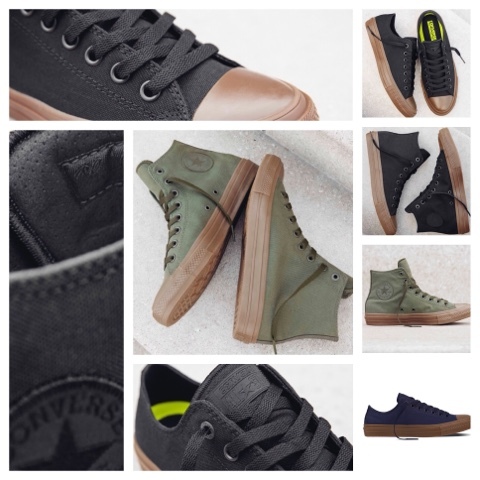 It costs Php 3,990 and is available in all Converse stores nationwide. Check out all the CHUCK Taylor designs at www.converse.com.ph or Facebook.com/conversephilippines. This is #ConversPHxChuckIIGum!